To make the bread pudding, first preheat your oven to 350 degrees F. Grease a 9 × 13-inch baking dish. Cut the bread into small cubes and put the cubes into the prepared dish. Scatter the raisins evenly along the top. In a bowl, whisk together the eggs, sugar, milk, vanilla, and cinnamon until frothy and well-combined. Pour the liquid carefully over the bread and mash everything together. Let this sit for at least an hour, mashing it a few more times so that all of the bread absorbs as much liquid as possible. Bake for 60-75 minutes, or until you see no liquid when you press the bread in the middle of the pan. To make the whiskey sauce, first melt the butter in a saucepan. Add the sugar, whiskey, water, salt, and nutmeg, and cook this mixture until the sugar dissolves, about 5 minutes. Beat the eggs in a bowl and then slowly add a bit of the hot whiskey mixture, whisking as you go. Once tempered, add the egg mixture to the whiskey mixture and return to the heat. When a boil is reached, cook for one minute, then remove from the heat. 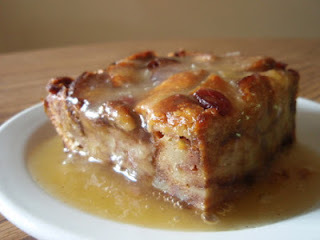 To serve, cut a square of bread pudding and cover it with whiskey sauce, making sure both are warm.